Passengers are welcome to board our ship at 6:00 p.m. After comfortably settling into your cabins, we'll introduce our crew at a welcome cocktail. The evening is free to do as you please. Join us for the excursion proposed: Guided tour of Brussels, discover a stately historical heart between town and village. Afternoon spent cruising to Antwerp. This lively city has retained its charm with narrow streets and immense squares lined with gable houses. Stroll in the old city in the company of our onboard hostess. Our ship will sail towards Rotterdam. 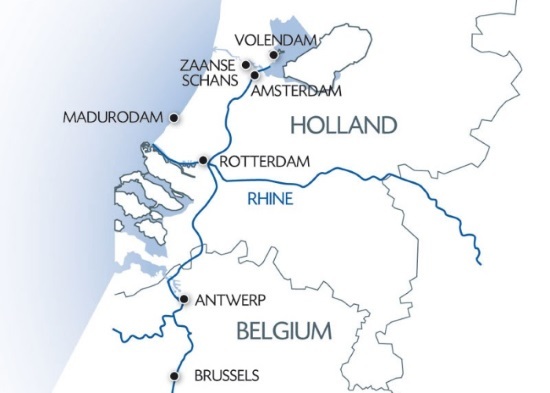 We will cruise up the Scheldt River, cross the border between Belgium and the Netherlands, and travel though the Volkerak and Kreekak locks. Enjoy an evening of entertainment. Morning spent cruising to Utrecht. The afternoon, join us for the excursion proposed: Visit of The Hague and its inner courtyards. Return on board in Amsterdam. In the evening, join us for the excursion proposed: Canal boat tour of enchanting Amsterdam at night. Discover the channels that reflect the history of this unique city. Join us for the excursion proposed: Guided tour of the historic heart of Amsterdam, full of remarkable architectural treasures. We'll stop by to watch a diamond cutter at work before returning to the ship. This afternoon, join us for the excursion proposed: Visit of the traditional fishing village of Volendam and the Zaanse Schans, a museum presenting Dutch crafts still produced in authentic 17th and 18th century windmills and picturesque barns. The evening is free to do as you please. Enjoy one last buffet breakfast on board before disembarking at 9:00 a.m. Coach transfer back to Brussels, arriving late in the morning. End of our services. From Brussels to Amsterdam via Rotterdam and Antwerp, cruise through Belgium and the Netherlands in search of their hidden treasures. Discover the breath-taking beauty of Brussels, the Belgian capital, and the many international organizations at The Hague. Travel to the heart of iconic places such as Volendam, a former fishing village on the Ijsselmeer, and Zaanse Schans. For navigational safety reasons, the company and the captain are the only authorized persons who can modify the cruise itinerary. Coach transfers are guaranteed for a minimum of 20 persons.